A summertime girl’s getaway to Mackinac Island proved to be the perfect quiet retreat to slow down and disconnect while enjoying a more simple nineteenth-century way of living without cars. After the first automobile drove the roads of Mackinac Island, it didn’t take long for automobiles (or, “horseless carriages” as the locals called them) to be banned completely on the island in 1898. 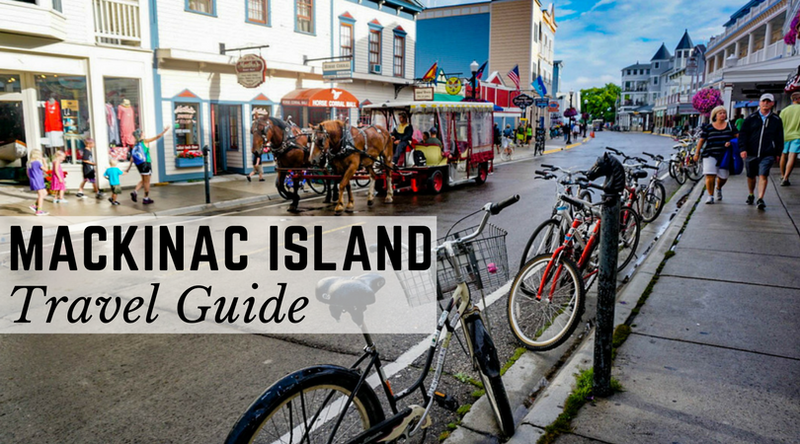 Make the most of your time with this Mackinac Island travel guide, and snag your own downloadable guide here! The first visitors to Mackinac Island were the American Indians from 1000 B.C. to 1650 A.D. when they used to paddle out to the island every summer to go fishing. Because the fish were so abundant, they referred to the waters as “the home of the fish” and since it was a sacred place to them, they named the island “Michilimackinac.” Europeans came to settle in the area in 1670, and eventually, the name was shortened to Mackinac by the 1820s. Fast forward to 1875, when Mackinac Island had become a popular summer destination, and Mackinac Island National Park was established — the second national park in America after Yellowstone. The whole island is one big block of limestone, making for some interesting and beautiful rock formations throughout Mackinac Island. Most places and activities on the island are open from May through September or October, but June through August is generally the best time to visit Mackinac Island for the warmest weather and most availability for activities on the island. Plan your trip with this Mackinac Island travel guide to make the most of your summer weekend getaway. If you are within a reasonable drive, making the road trip is your best option. Alpena County (APN) and Traverse City (TVC) are the closest commercial airports, but they are both small with limited flights (likely meaning increased rates as well). For those flying in, the better (and more affordable option) will be flying into Detroit Metropolitan (DTW) and renting a car. In Mackinac City, you’ll need to take a ferry out to the island. Daily and overnight parking at the dock is free, but there are fenced and covered lots available for a fee. The cost of the ferry is about $25 round trip per person, and it’s only a 15-20-minute ride to the island. We took the Shepler’s line, but there is not much of a difference between ferries so it doesn’t really matter which one you take. Just make sure you get on the right ferry on the way back if you buy a round trip ticket! Bring your walking shoes: There are no cars on the island, so you will mainly be walking everywhere. Prepare yourself for the smell: Aside from walking and biking, the main way to get around is by horse and carriage. While the horse smell may be overpowering at first, you’ll get used to it after a while. Embrace the slow pace of island life: A trip to Mackinac Island is an opportunity to slow down and enjoy an old way of life without traffic or vehicles speeding by. We stayed at the Lake View Hotel, which was just okay. If you find a great rate and cost is your priority, go for it, but if you are more flexible I’d recommend either Mission Point Resort or Island House Hotel (Mackinac’s oldest operating hotel). Both are right along the coast of the island, but Mission Point is an extra 10-minute walk away from central Main Street. Mission Point Resort was previously a college that remained open for only four years and was purchased to try and establish another college before being used as a summer hotel in 1977. These hotels are all listed on Hotels.com and Travelocity, but since their peak season is so short, make sure to book far in advance if possible as most hotels will sell out during the summer months. Riley’s Gill: A casual lunch alongside the marina complete with some of the best french fries around. Yankee Rebel Tavern: A history-packed lunch in a classic American restaurant named after Ambrose R. Davenport, who was assigned to the island by the US Army and remained there after leaving the military. He became a prisoner of war during the War of 1812 after refusing allegiance to the British crown. His wife, who remained on the island, was harassed for this refusal and she became known as “the wife of the Yankee Rebel”. Chianti: A classy house-made Italian dinner cooked to perfection, topped off with exceptional service. By far my favorite meal on the island — you can’t go wrong with just about anything you order. Bistro on the Greens: Lunch or dinner (or just appetizers) along the Greens of Mackinac, with views of Round Island Lighthouse and Lake Huron as the backdrop. I highly recommend the Watermelon salad. Being an island, you won’t find a ton of activities to choose from, but that’s the point. Definitely take part in the following things to do on Mackinac Island, but also find time to relax, browse the shops around Main Street, and soak in the interesting history of the island. This is a classic activity when visiting Mackinac Island, and I highly recommend it as one of the first things you do when you arrive. It’s a great way to get your bearings on the island as you’re carted around by horses with a cheerful narration from your tour guide. Mackinac Island Carriage Tours is the oldest Horse and Buggy Service in the world. They’ve been providing carriage tours of the island all the way back since 1869! I recommend walking over to book your tickets earlier in the day, as they don’t take reservations and the tours don’t leave at set times. The tour lasts about 2 hours. Your first stop will be the Surrey Hills Museum, where you can admire antique carriages, peruse the gift shop, or grab a snack (I highly recommend the fresh donuts). You’ll continue your journey through the natural forests and back roads while learning historical facts and interesting tidbits about the island and its landscapes. One of my favorite stops was at Arch Rock, a 146-foot tall natural limestone formation that is 4,000 years old and one of the most photographed places on the island. You can also opt for the combination ticket which includes access to the Wings of Mackinac Butterfly Conservatory. While you are on the horse drawn carriage tour, one of the last stops is at Fort Mackinac, so you’ll have the option to get off here if you’d like to explore the fort more (requires a separate admission fee). Otherwise, you can always return from the front entrance as well. Fort Mackinac was founded during the American Revolution and served as a British and American military outpost from 1780 to 1895. It is now a museum that is a part of Mackinac Island State Park. You can find the best views of Marquette Park from the fort, which was known to the soldiers as their garden. Inside Fort Mackinac you will find 14 original buildings all open to the public, one of which, the Officers’ Stone Quarters, is the oldest in the state of Michigan (constructed in 1780). The fort also houses the Post Hospital, which was built in 1828 and is the oldest standing hospital in Michigan. Other buildings include the Post Schoolhouse where soldiers and their children could learn writing, reading, arithmetic, history, and more, the Post Guardhouse which served as headquarters for soldiers on guard duty and a jail for prisoners, and the Wood Quarters that served a number of functions over the years until it became a bar and lunch room for the soldiers in 1889. Rifle and canon firing demonstrations by costumed interpreters are conducted throughout the day, and there are interactive exhibits throughout the fort to keep kids (and adults) engaged. Your ticket to Fort Mackinac includes admission to a number of other historical landmarks in town. This store gives you an idea of some of the general merchandise that was sold back in the 1800s, and I recommend making the quick stop to walk through the building. It was in this American Fur Company Store on June 6, 1822 that Alexis St. Martin, a French Canadian voyager, was shot in the stomach accidentally from just three feet away. Dr. William Beaumont was the local surgeon who took care of St. Martin, though his wound never properly healed. Instead, it left a permanent opening in his stomach, and Dr. Beaumont took advantage of the opportunity to learn about the human stomach and digestive process through this hole. This is a must for anyone visiting Mackinac Island. Even if it has been years since you’ve been on a bike, anyone who is capable of riding a bike can comfortably complete this 8-mile loop around the perimeter of the island. I promise it’s enjoyable and not as intimidating as it sounds. This loop takes you around M-185 (Lake Shore Boulevard), the only highway in America where no cars are allowed. It is recommended to head east from the Visitor’s Center as the mile markers proceed in that direction. There are stops along the way designated with historical markers or other informational signs, like British Landing, where the British landed in 1812 and demanded the surrender of Fort Mackinac. There are also plenty of beautiful views along the route, so take time to stop and enjoy some of them! The path is clearly marked, so don’t worry about getting lost! Bike rentals can range from between $8 to $13 an hour. Allow for at least 1+ hours, depending on how often you choose to stop along the way. We used Mackinac Island Bike Shop and Mackinac Cycle also has good reviews on TripAdvisor, but there are many bike rental companies to choose from. Because there are so many bike rental options, there’s no need to plan ahead for this one. Keep an eye on the forecast and pick the day with the best weather for your bicycle journey! There are so many fudge shops around the island I don’t even need to make a recommendation. They are all amazing. Take your pick of one (or more) of the fudge shops you’ll see just about every time you turn your head. Despite its appealing description, dinner at Goodfellows was underwhelming. The food and service was so-so, and it seemed overpriced for the quality. However, I would recommend grabbing a drink at the Goodfellows sports bar down the street from here on the corner. This one may be a bit more controversial. The Grand Hotel is well-known as being the thing to do on Mackinac Island. There are three main reasons I would not include it on your Mackinac Island trip. The tea is not actually in the tea room. This is where the doubts about The Grand Hotel started to kick in. We discovered this quaint, beautifully decorated lunch room and were looking forward to our afternoon tea. Since we were a bit early, we took a seat in the parlor to wait for the room to open. We quickly realized it would not be opening — the tea was to take place right there, buffet style, while sitting on couches. For $40 per person? No thanks. We were glad we didn’t purchase our tickets yet! The air of pretension is thick. This didn’t take long to notice after people watching from the parlor. And to make matters worse, the place aims to take you back in time to the late 1800s, which I would normally love, but in this case it seems to come along with the baggage of segregation. It’s not representative of the rest of the island. They’ve created this space that is nearly an all-inclusive resort, so it’s not necessary to leave the hotel grounds if you don’t want to. There is so much more around the island to see, but if you’re paying for all the extra amenities at The Grand Hotel you’ll be much less likely to explore the rest of the island. But hey, if you have to go see what the hype is all about, I completely get that. Just be prepared to pay… even if you only want to walk around and check it out. They charge a $10 per person entrance fee for non-guests to enter the hotel, which adds up if you’re with a larger group. If you do go, I suggest having a drink (I recommend the strawberry daiquiri) at the Cupola Bar, which was the one part I really enjoyed about The Grand Hotel. Surprisingly, for a large drink the price only rang in at around $9, so it wasn’t as expensive as you might expect. Especially for those living in the midwest who can make the drive up to Mackinaw City, this trip will certainly be a memorable one. Use this Mackinac Island travel guide (downloadable version here) and book your summer weekend escape to go back to a simpler time on a peaceful Michigan island. What else would you add to this Mackinac Island travel guide? Share your suggestions in the comments below! I’m bummed out about The Grand Hotel. It looked like a fun place to visit, but I don’t think the entrance fee is worth it. Ever since I saw Somewhere in Time with Christopher Reeve’s, it looked magical. Thanks for the tips! I would love to spend my summer on Mackinac Island. Amazing guide, Marissa! This place looks/sounds amazing. I’ve been wanting to go to Traverse City, actually have an invitation to go this August, but I’m not sure going to be able to make it, this would be such a great side excursion. Great seeing you again in Nepal. Absolutely those are a perfect two to combine into one trip! Great seeing you again as well. We live in Ohio and have been to Mackinac Island 5 or 6 times. We thoroughly enjoy it there every time we go and we’ve rarely done the same things twice (except biking around the island, flying kites at Mission Point and the butterfly museums). We bring our own bikes, stay on Main Street (Main Street Inn being our favorite place to stay), RELAX and really enjoy not being worried about our daughters doing their own thing. We’ve been parasailing, ghost hunting, ice cream eating, fudge eating, picture taking, geocaching, shopping, eating at almost every restaurant at least once, and the list goes on! This is truly our favorite place to vacation. That is awesome! It really is such a great place to relax and enjoy the summer. I’ll have to try some of those other activities the next time I visit! That is so great to hear! It’s definitely a place you can keep returning to again and again. And it sounds like it will also be a special place for you with fond family memories. Thanks for sharing! Absolutely!! So glad you enjoyed it!